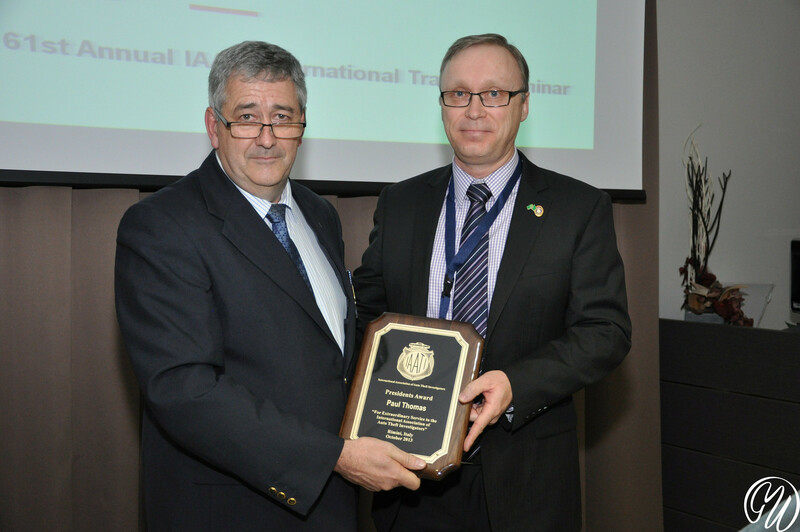 For his Service to IAATI, Executive Director John Abounader receiving the President’s Award from President Todd Blair. Presidente de rama, Daniel Beck, recibiendo el premio del Presidente de Presidente Heidi Jordan por su destacada labor y dedicación incansable a IAATI y a su rama. A través de sus esfuerzos, el número de miembros y países representados dentro de su rama crece día a día, un crecimiento que no ocurrirían sin su guía y liderazgo. The award was created in 1985. It is intended for the President of IAATI to honor any members who have distinguished themselves by giving extraordinary service to IAATI. The 2014 award was presented to Kat Anderson. Kat has worked at the South Plains Auto Theft Task Force in Lubbock, Texas USA since 1998 and is currently the Treasurer of SCRC. 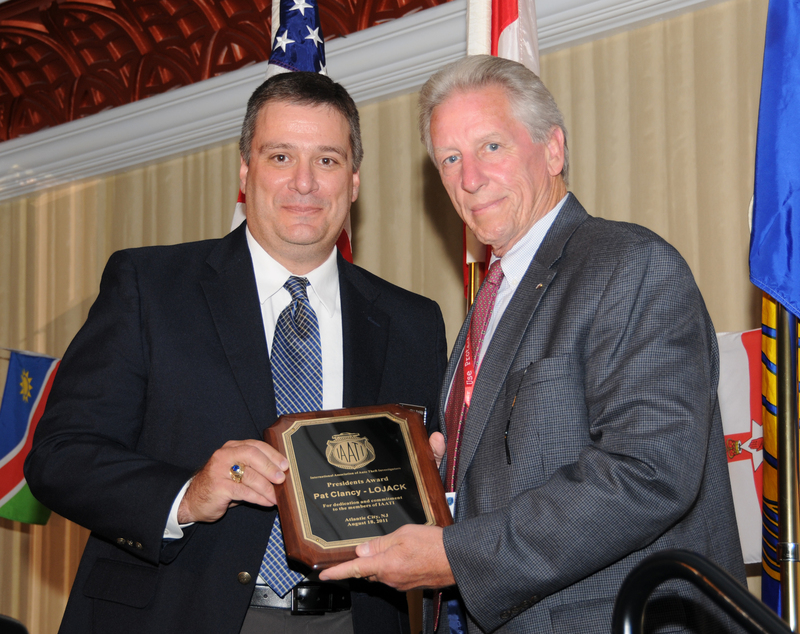 Paul Thomas (right) receiving the 2013 President's Award from International President John O'Byrne. 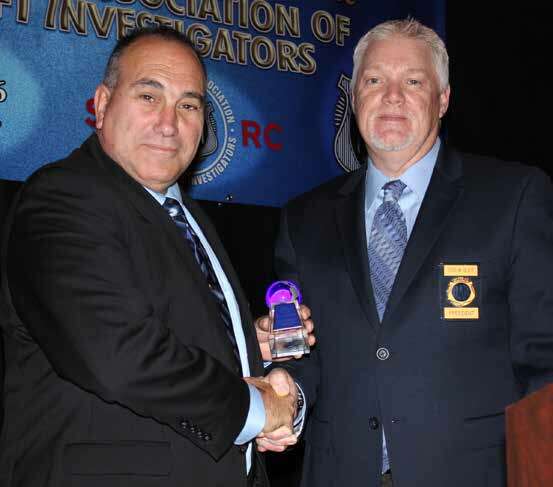 Pat Clancy – Pat is Vice President of Law Enforcement for LoJack and has been a staunch supporter of IAATI for 25 years. I’ve known Pat since 1996 and consider myself fortunate to have known Pat as a friend and colleague. Over the years Pat has seen the many changes in auto theft and has realized that developing and continuing a true partnership with IAATI is invaluable. The relationship between LoJack and IAATI has been much appreciated over the years and is largely due to Pat’s dedication and perseverance. As a result, I awarded Pat Clancy of LoJack the President’s Award because of his personal and professional efforts over the years. Mark Bennedick – Mark works for Suncorp Insurance in Brisbane, Australia, currently serves as President of IAATI’s Australian Branch and is also a director on the IAATI board. Over the years, Mark has been instrumental in the continued success and growth of the Australian Branch. He played a vital role in the success of the IAATI conference held in Sydney in 2008 and also has spearheaded the chapter’s continued expansion by coordinating the upcoming conference to be held in Taipei. He also took on the role of chair of the certifi cation committee and is currently working on improving and updating the certifi cation information and process. I awarded Mark Bennedick of Suncorp Insurance the President’s Award because of his vision and contribution to the continued success of the Australian Branch and of IAATI. Both Pat and Mark unselfi shly dedicate their time and expertise for the continued success of IAATI. Many times, people who toil behind the scenes don’t do it for the recognition but simply because they see the need and step up. Over the years it has been a pleasure to work with both gentlemen. I admire their efforts and appreciate their friendship. Please join me in congratulating them on their well deserved recognition.